Whether we like it or not, meetings are an unavoidable part of the modern office job. 15 percent of an organization’s collective time is spent in meetings. This figure has increased each year since 2008, so it doesn’t look like we’ll be ending the practice anytime soon. It’s a lot of time spent sitting in rooms listening to people talk. But not everyone in the room will be able to understand and contribute effectively. About 60 percent of the American workforce has some degree of hearing loss. This means that there are a surprising number of workers who are struggling to understand their colleagues and contribute meaningfully in these discussions. Fortunately, over half of all communication is actually conveyed through body language. There are other ways to understand a person and what they are saying other than the words that they use. Interpreting non-verbal cues like facial expressions, gestures or body movements can help us to decipher the emotions and layers of meaning behind a person’s words. These physical clues are helpful for people with hearing loss, as they provide vital insight which can make it easier to understand what is transpiring in a meeting room. If you’re looking to improve your awareness of these non-verbal cues, you should take advice from the experts. Laurie Achin is an American Sign Language (ASL) professor at Northeastern University, and a member of the deaf community. She has daily experience observing people’s expressions, and body language as they communicate with others. Achin and two other sign language interpreters–Katie Fitzpatrick and Miriam Horwitz–all agree that non-verbal communications make more of an impact than the actual words being said. 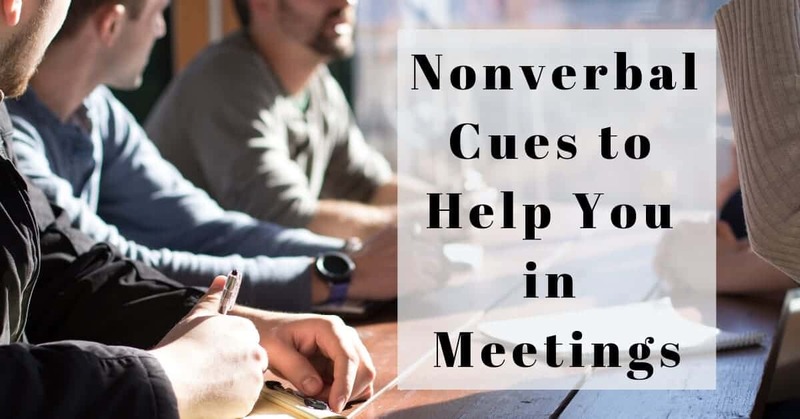 They offer some tips on how to read nonverbal cues in meetings. Speakers of any language do a lot of what is called ‘backchannelling’. These are the important utterances that are made in between points to show that they understand what is being said. Have you ever had to sit through a long anecdote from a partner or friend? It’s pretty much guaranteed you had to offer a few uh huh’s and mmhmm’s to signal that you were listening to them. If you find it tough to hear these sounds, then it is better to maintain eye contact and look for other cues such as nodding and other head movements. Remember, this doesn’t necessarily mean that they agree with you, merely that they understand the gist of your point. So, make sure you keep an eye out for these cues the next time you’re giving an important presentation. The need to make points as they enter your head can be hard to resist. Social mores, however, dictate that we shouldn’t interrupt people so much in meetings, but rather wait for them to finish what they are saying before sharing our own thoughts. That’s probably why there are so many visual cues a person can give to show that they want some time on the floor. According to Achin, if a person looks restless in their chair, or hunched forward, that’s a strong sign they want to add something. Next time you have a meeting, take time to scan the room to see if anyone wants to interrupt, particularly if you make a point which is still up for discussion in the group. Remote working is becoming more popular and as such you may be in more remote meetings or conference calls with offices in other countries. If you are organizing such a meeting, set a ground rule that you will allow some time after each point to allow space for feedback and questions. The strategies in this article can only take you so far. Chronic untreated hearing loss can detract from your effectiveness at work, especially if your work involves collaborating with others. It can also have an adverse effect on your confidence and morale. If you regularly miss out on jokes and avoid noisy after-work social occasions because of your hearing loss, you could end up feeling isolated from your peers. Perhaps most importantly, untreated hearing loss has been shown to negatively affect your earning power at work. Various studies show that those with hearing loss earn on average $20,000 less annually than those with no hearing issues. To set yourself up for long-term success in the workplace, it’s best to have your hearing loss treated by a qualified professional. Schedule your hearing test with Hearing Group today! At Hearing Group we want to make achieving better hearing as simple and convenient as possible. That’s why we offer hearing exams and hearing aid test drives to ensure that you find the technology that works best for your hearing needs and lifestyle. Get in touch today!